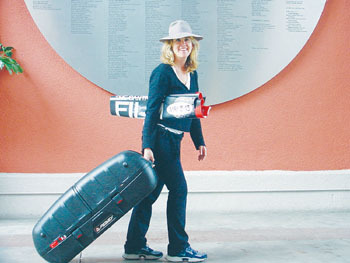 On a Roll: In classic style, Santa Cruz Film Fest director Jane Sullivan rolls her own equipment. Jane Sullivan is a classic working woman. Classic in her dress style, which is always fabulous, and in her energy, which always seems boundless. Take our interview, which takes place on a rainy Friday morning inside the neon fish-lit atrium of the Museum of Art and History on Front Street. We meet there because Sullivan has to break down the equipment from CineMAH, an event she worked on the night before as director of the Santa Cruz Film Festival, which has partnered with the museum to put on after-hours film events for the community every first Thursday. Yes, Sullivan multitasks even during interviews, which is understandable, given that she is, in her own words, "a public relations woman for hire." That said, she doesn't take on any old gig. 'I've done a bunch of parties in the architectural industry and I was hired by a federal political action committee just before the election," says Sullivan, who can't really afford to be so picky, but figures that doing so ultimately pays off. "I want to work with the right people, and sometimes it takes time to work that out," she explains. In between official duties, Sullivan squeezes in other projects, including a documentary on 99-year-old photographer Seema Weatherwax and a short about New York artists Christo and Jeanne-Claude's "The Gates," the fabled 7,500 free-hanging saffron-colored fabric panels which recently "bloomed" in New York's Central Park. "I didn't get an interview with them, but Jeanne-Claude did call me back to say they weren't giving any interviews," laughs Sullivan, who finds it odd that artists would isolate themselves while in the middle of a multimillion-dollar project. "For me, partner or die is my new code," says Sullivan. "It takes all this life force and all kinds of skill sets to pull off my projects. I couldn't possibly get them done on my own." Asked what her advice is for women in business, Sullivan cautions against seeing oneself as anything but a person‹and against thinking only about the Yankee dollar. "'Women in Business' implies you're making a lot of money. Well, I just don't, but I also don't want to work for just anybody. One of the great things about working for myself is that I'm not a corporation. I'm really an entity." Observing that any woman 45 years old and over has probably experienced some flavor of harassment on the job, Sullivan says while the situation has changed over the years, she still sometimes experiences gender-based bias. "It never occurred to me to think of myself as a woman in business, until recently, when hierarchical males reminded me that I am. It's a little power trip that happens. So, my advice is don't feed the fear, but when things do come up that are gender-driven, express yourself. If you get harassed, or think people are disrespectful, speak out, or you won't get anywhere." She notes that such situations rarely come up in Santa Cruz in particular and California as a whole. "We live in Little Athena here." In fact, her pet peeve is her own sensitivity. "When you risk throwing yourself out there, you're liable to get criticized, so my pet peeve is with myself. I'm incredibly übersensitive. For my sister, who I model myself after, this stuff is like water off a duck's back. But as Johnny Chesky, who was an organizer of the first film festival in Santa Cruz back in the '70s, once said, we all have the weight to bear each other fortune." Above all, Sullivan warns against getting isolated. "I can spend all day sitting behind a computer, emailing people, writing press releases and figuring out strategic ways to get things done, but sometimes I feel I'm in a bubble. You've got to get out there. You can build the greatest project in the world, but if no one sees it, it's not alive. From-concept-to-finish is my big thing." It was in this partnering spirit that Sullivan was on the phone a few Sunday mornings ago, at an hour when most people would rather be sleeping. Why the early start? The Santa Cruz Film Festival, which this year takes place May 5-13, is partnering May 7 with Cinemasports (a.k.a. "the Iron Chef of Filmmaking") and Sullivan was teleconferencing to help make the event pop. The concept, she explains, is this: Filmmaking teams from Sophia, Bulgaria; Frankfurt, Germany; London, U.K.; and Paris, France, have 10 hours to complete a four-minute movie, with a list of "ingredients" given to them that morning. "The movies will be screened that same night, while they are still hot and fresh," says Sullivan, whose Sunday morning phone call helped contribute one "ingredient," which relates to Santa Cruz, but whose full identity will remain a mystery until the May 7 screenings. With participating filmmaking teams required to use all these mystery ingredients, Sullivan is excited that a whole bunch of new people will get to know something about Santa Cruz. "That's amazing, that's life force, that's partnering! That's International Cine!" she says. As for being director of the Santa Cruz Film Fest, which is now in its fourth year, Sullivan laughs. "I feel if someone took a picture of me four years ago and then one now, it would be a little like the president. People would say, 'Oh my God, how much she's aged!' Granted, my job is not nearly as life-threatening, but it's definitely a challenge to create something raw and keep it going. You can't do anything without other people and in this case that includes the film fest's board, volunteers, screeners and Johnny Davis!" For information, call 831.459.7676 or check out www.santacruzfilmfestival.com.